I have been blogging for three years now. My blog is mainly about my cooking and a place to share recipes that I have grown up eating, where I recreate what I have learnt from my mum and dad. 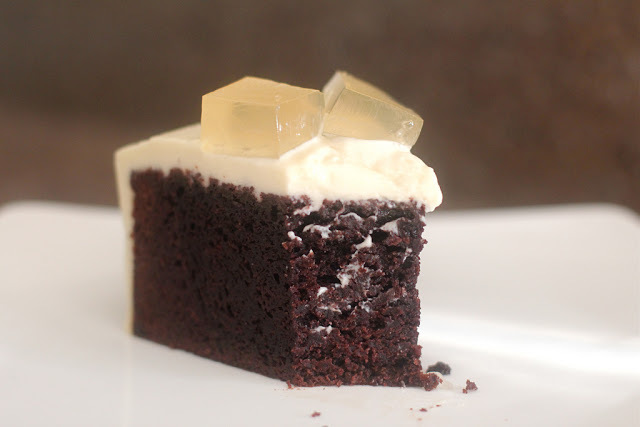 This will continue to be one of the focuses of my blog as I want to document all these recipes. 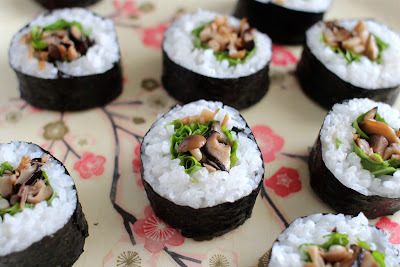 Blogging has also been a motivation for learning to cook new dishes and revise old dishes. 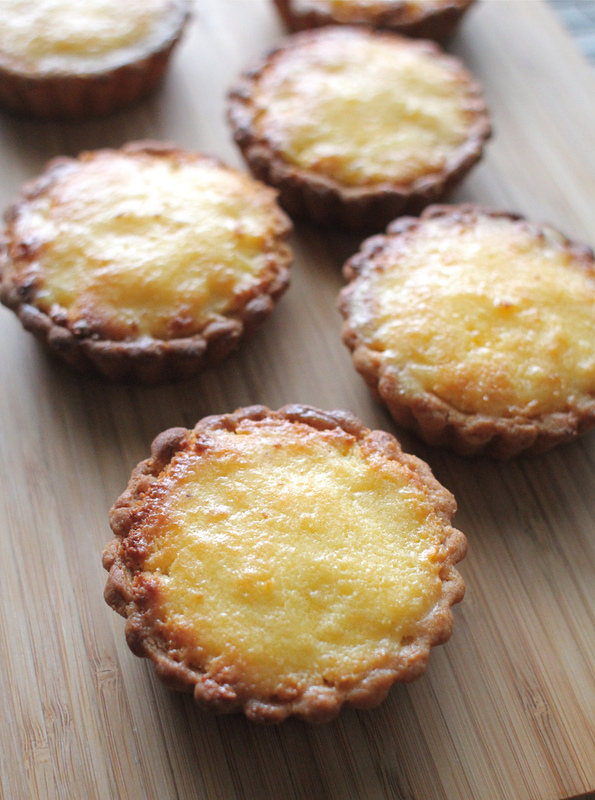 I have become a better cook because I blog and want to share interesting kitchen adventures. Nowadays I like to get a bit more creative with food because maybe I am feeling a bit more confident at what I do. Over the past year I did my first series of themed posts. It was a challenge that I put myself up to as my blog gets a lot of apocalypse related keyword searches like what to eat in an apocalypse, apocalypse food, apocalypse cooking, apocalypse spice, apocalypse desserts etc. (please note that my blog is named after the Tool song Eon Blue Apocalypse and has nothing to do with the end of the world!). So in the lead up to the Apocalypse last year on 21.12.2012, I decided to do some apocalyptic posts covering apocalypse inspired dishes, apocalypse related cooking and apocalyptic film dishes. I started out not really knowing what I was getting myself into or if I would come up with anything good. I thought that it would just be a funny thing to do but I took it quite seriously. I spent a lot of time working on apocalyptic dishes and in the end I produced what I think are some of my best blog posts (see links to all dishes here). I really enjoyed researching ideas and the creative process of putting together an apocalyptic dish. I learnt new cooking techniques to put together the elements of dishes and explored how I could relate the apocalypse to food through cannibalism, survival, films and game theory. So I have decided to undertake another themed posts challenge for 2013. Music was my first major passion in life but nowadays it’s surpassed by food and blogging. This year I will be putting the two together and doing some music inspired dishes. I am currently researching and brainstorming ideas on how I can link music and food together. To celebrate my blog’s 3rd birthday and thank all the readers of my blog, twitter followers and Facebook fans, I will be giving away a Mix CD of some tunes that I like to listen to while I am cooking. The tracklist will be a surprise (concealed in an envelope in the inside cover). All I will say is that it will be an eclectic range of instrumental tracks ranging from jazz, indie, electronica, math rock, post rock and post metal that I spent my summer break carefully putting together. 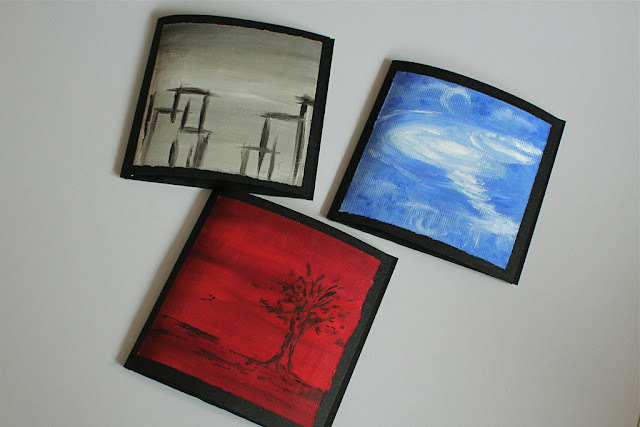 I also hand painted the artwork (I used oil paints), hand sewn the CD insert and handwrote the tracklist. 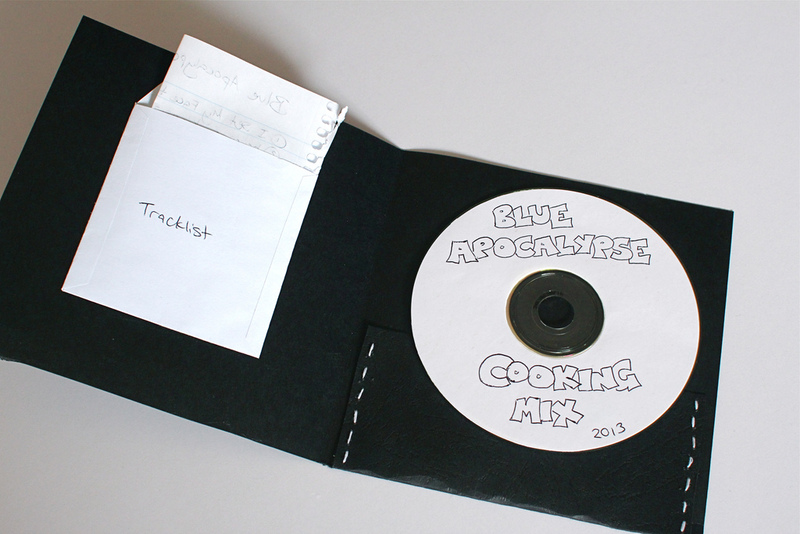 If you would like to win a Blue Apocalypse Cooking Mix CD, just write a comment below that contains the words “I want a Mix CD” and leave contact details (email/website/twitter handle). This competition closes in 2 weeks at midnight on Friday 25 January AWST (Perth time). Winners will be drawn randomly and announced on Saturday 26 January. There are three Mix CDs available and I will post to anywhere in the world. 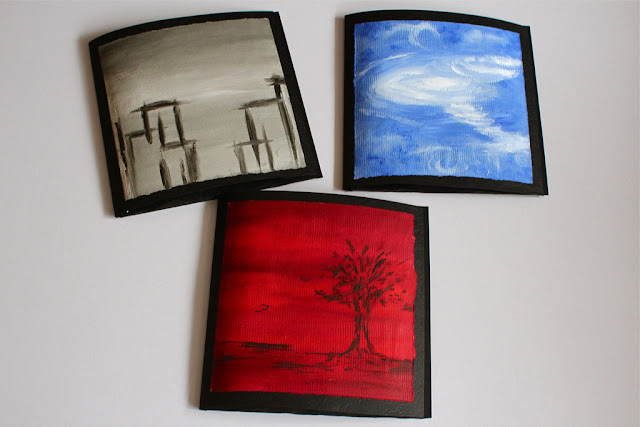 p.s it has been a long time since I painted anything, what cover art do you think is the best? I want a Mix CD! I'm looking forward to seeing the music inspired dishes. Any Perth bands making an appearance? I was wondering what you would be writing about following the end of the world! The art work is wonderful are the oils or watercolours? Congratulations on 3 years, Ai-Ling! I know that I've drawn on your recipes at least two times (I hardly cook, so that is a lot for me) during that time, both to critical acclaim. All the best with further dishes. The music inspired ones sound great. I always mistype google as 'goo' so I would be curious as to how that would be as a dish (i.e. Sonic Youth's 'Goo'). p.s. I want a Mix CD! The covers look great! congrats on 3 long years of food blogging. the mix cds look really good! so much details in the cd bag. you should make more of them. Gonna get back into painting this year and do more arts and crafts! Hey, congratulations on this anniversary! Love the artwork... and that chocolate cake, whoa! Thanks Lizzy :) Chocolate cake needs to be eaten in moderation! 3 years and so popular - congratulations! The artwork is lovely and I want a Mix CD please. It's nearly my birthday :) Have a great weekend. Congratulations beautiful! Your blog continues to entertain and inspire me although there is no way Ill ever have your level of prowess in the kitchen. Didn't know you could paint, but then not surprised you would have a few more arty talents hidden up your sleeve. So definitely; I want a mix CD please! It has been great meeting you and having blogger adventures together! I want a mix CD!! Congrats on 3 years!! I love that you put so much thought an research into your posts, I always learn something and am inspired to follow your lead and put a bit more effort into things!! I'm looking forward to hearing about your future food plans, you do a lot of awesome things yourself with the great fundraisers you organise!